A perfect combination of scents and flowers for the man of your live. L'eau D'issey Pour Homme 50ml, a fresh herbacous scent with warm, woody undertones. Reflecting the principles of his women's scent, it embodies yin and yang, and the extreme polarities of the world. 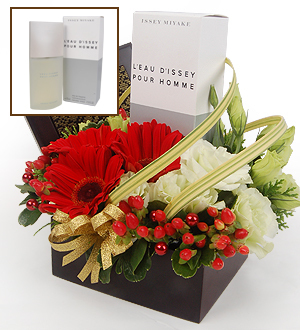 L'Eau d'Issey Pour Homme is a fresh yet warm, woody scent accented with spicy notes. Featuring notes of Tangerine, Cypress, Clary Sage, Geranium Bourbon, Blue Water Lily, Nutmeg, Saffron, Cinnamon, Amber Tobacco, Vetiver, Sandalwood, and Musk. Gift comes in a beautiful Kroft box with Gerberas and Eustomas.